HMS Severn is alongside Cork City today (photographed in the Evening Echo). Its not the crusties, but the "anti war" RSF that are the problem there. ARA Libertad is due to visit Cork later in the year, Possibly June. Check out this link on Indymedia they are tripping over themselves tp protest about the visit of HMS Severn. Rain stopped play. Just shows their dedication to the cause when a bit of rain keeps the protesters away. Delighted to hear that they did not show up I am really getting sick of all these anti-everything. They must lead unreal lives. A guided missile frigate from the German Navy is to visit Dublin next month. The March visit by the FSG Augsburg, normally based at Wilhelmshaven, is the latest in a series by NATO navies, including warships from Britain and America. 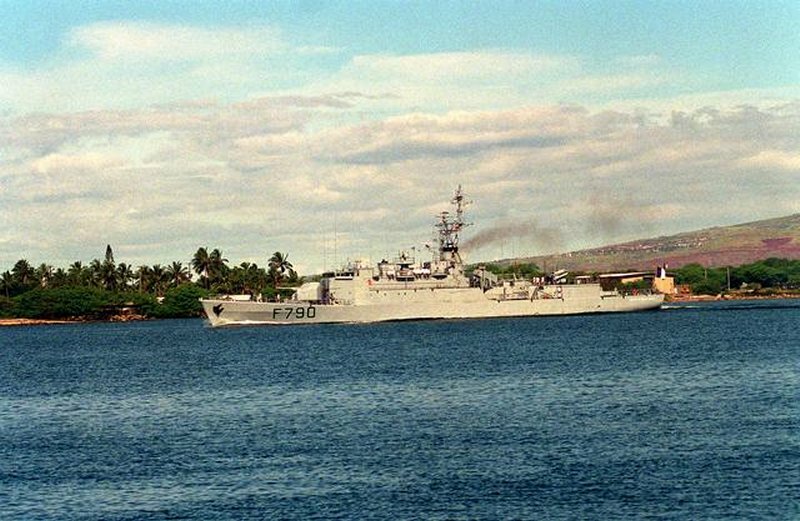 The 3680-ton frigate carries Harpoon anti-ship missiles, and Sea Sparrow and EAM surface-to-air missiles. It has a crew of 219. Yeah June, due to visit Galway and Dublin too. The Irish Naval Service are doing some travelling this summer also, Including Canada, the Black Sea and the Baltic. Don't forget the Black sea resorts too..
...question, is this an exceptionally busy forgin visit schdule, they seem to be sending ships further then normal and more of them, or do they do these every year? They do this every year. Malta (Valetta)has seen Irish Naval vessels almost every year since the early 80s. American Trips are almost annual, usually coincide with Paddys day. Kiel is annual, though its rare to see two ships go. Currently in Cork is the French Frigate "La Vallee", or to give it its full title, "Lieutenant de vaisseau Lavallée". Another of the D'Estienne d'Orves (A69)class, a type often seen in Cork. This is the same ship type as the Argentinian ARA Guerrico, which was hit by small arms and 84mm fire during th eBattle for South Georgia during the Falklands war of 1982. The type is due for retirement soon, having been in service since the early 70s. The single 100mm gun is mounted forward, immediately ahead of the large bridge. and the 375mm ASW rocket launcher is mounted on the deckhouse aft. France still has considerable overseas interests and the D.Estienne D'Orves class share some of the duties involved. For such distant deployments they mount an MM.38 Exocet SSM on either side of the funnel. which confers some independent offensive capability. although such a small ship is intended to be dependent upon other vessels or aircraft for protection against a serious air or surface threat. is that French Frigate in Dublin at the moment ?? It seems Libertad will now not be visiting Cork. Yup its a sub alright!